It's quite some time that I handn't the chance to listen to something new from Gary Flanagan. If you aren't new to Chain D.L.K. you know that we kinda grew together as we talked about his music since day one. The last time I checked his music was with his album "Future fashion" released by Cohaagen in 2002. After that he released some stuff for his own Flying Saucer but the "Licorice" EP seemed to be a demo and the following "Drunk", I don't know if it has been distributed or not. Anyway... 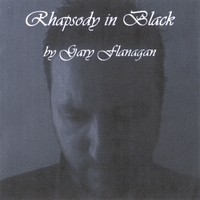 The new album RHAPSODY IN BLACK sounds different from the synthpop we were used to listen from Gary. It gathers different atmospheres and solutions that are still sounding '80s but instead of being influenced by electronic pop Gary on this one seemed to be more into the guitar melancholic new wave pop of China Crisis or The Lotus Eaters (with some New Order influences here and there). In this way the new tracks are sounding more intimate but without sounding mellow and someway he didn't lose his dark vein. You could still find his characteristic songwriting but this time the big part is played by guitar and by synth sounds different from the the old analogue sounds he was using on his tunes. On this album you can find 16 songs that include also few folk influences along with pop wave. By recording at home and changing slightly his style, Gary found a new creative vein that is sounding fresh and personal. The next work seems that it will see him back to electro and to darkest sounds but meanwhile we have RHAPSODY IN BLACK.